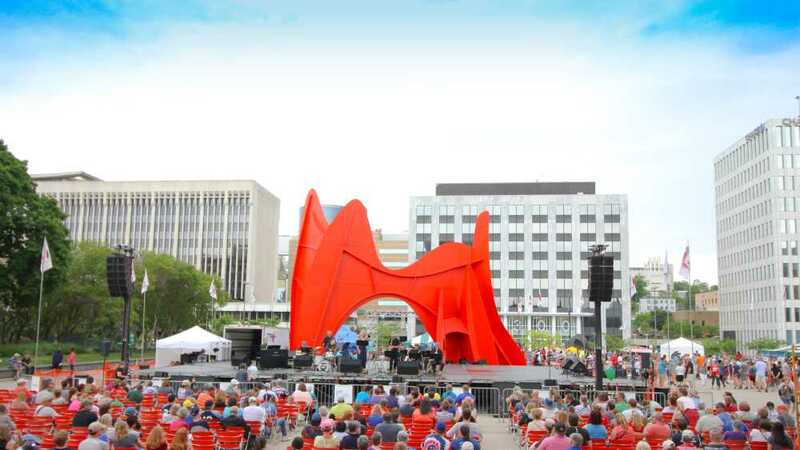 n 1969, Alexander Calder’s La Grande Vitesse was installed in front of City Hall in downtown Grand Rapids. The 43-foot-tall, vibrant red stabile, which became known as “The Calder,” inspired a celebration – one that’s grown to encompass most of downtown Grand Rapids. Festival of the Arts is a FREE three-day community event that features several stages of performances, a juried Regional Arts Exhibition, and dozens of food booths run by non-profit organizations. Plus, creative activities for children and adults to enjoy making their own art as well as purchasing art from West Michigan artists. Every purchase at Festival from food to art to t-shirts and posters gives back to the West Michigan community. Festival draws hundreds of thousands of people each year to celebrate the arts and kick off summer.